A total of 130 entries have been received for £100,000 Blue Square Bet Stewards' Cup, run over six furlongs on the fifth and final day of Glorious Goodwood, Saturday, August 4. Irish handler David Marnane has entered Jamesie (14/1 co second favourite with Blue Square Bet), who was runner-up in the fiercely competitive seven-furlong Buckingham Palace Handicap at Royal Ascot on June 22. "I have been delighted with him since Ascot. He has come out of the race well and appears to be at the top of his game. "He is a funny horse as he needs to be played late and, although the winner won well at Royal Ascot, Jamesie beat the group on his side easy enough and he doesn't do a whole lot when he hits the front. I would have liked to see him race on the other side, but we were delighted with the run. "He is a versatile horse in regards to trip and, although the Bunbury Cup is over seven furlongs, I wouldn't mind seeing him drop back a bit as he is a horse who needs to come off a fast pace. "He likes top of the ground, but the soft ground at Ascot was OK for him." 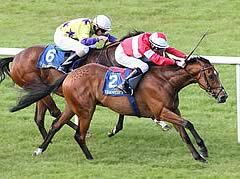 The last Irish-trained to triumph in the Blue Square Bet Stewards' Cup was Red Alert, trained by Dermot Weld in 1974. Last season's impressive winner under top-weight, Hoof It (16/1), has been given entry, and Mick Easterby's charge proved himself a top-class sprinter last season when going on to finish a close third in the Group One Haydock Sprint Cup in September. A total of five horses have won the Stewards' Cup twice, most recently Sky Diver in 1967 and 1968. Roger Charlton has a strong hand headed by the unexposed three-year-old Top Offer (12/1 co-favourite), while he could also saddle Newmarket handicap scorer Mince (16/1) and the promising Tioman Legend (25/1). The Beckhampton handler has an excellent record in the Blue Square Bet Stewards' Cup, having enjoyed three victories courtesy of Harmonic Way (1999), Patavellian (2003) and Genki (2009). Waffle (12/1 co-favourite), runner up in the Wokingham Handicap at Royal Ascot for the second year in succession last month, is one of five entries for David Barron and he could reoppose Wokingham Handicap third Hawkeyethenoo (16/1), trained by Jim Goldie, and the fifth Dunagannon (20/1). David Nicholls, who has sent out three winners of the Blue Square Bet Stewards' Cup, has made 10 entries including Tax Free (25/1), who was second last year. Henry Candy, who is also renowned for his sprinters, has entered Group One winner Markab (25/1) and Seal Rock (20/1). The talented Mac's Power (12/1 co-favourite) is one of two entries for James Fanshawe along with Hallelujah (12/1 co-favourite), who recorded a comfortable course and distance victory on June 8. Fellow Newmarket handler William Haggas has entered Cape Classic (12/1 co favourite), an eye-catching scorer at Windsor in May and impressive York handicap scorer Sholaan (20/1). Weights for the Blue Square Bet Stewards' Cup will be revealed on Wednesday, July 11. There is a maximum field of 28 for the Blue Square Bet Stewards' Cup. Horses that fail to make the final field are eligible for the Get Your Bet On At Bluesq.Com Stewards' Sprint Handicap, the opening race on Saturday, August 4. Class 2, Heritage Handicap, £100,000 Total Prize Fund. Six furlongs. For three-year-olds and upwards. Goodwood, Saturday, August 4, 2012. Weights: highest weight not less than 9st 10lb; minimum weight 7st 12lb. Penalties, after July 7, a winner 6lb. Entries closed, July 3, entries revealed, July 4 (130 entries), weights revealed July 11, scratchings deadline noon, July 17, five-day confirmation stage Monday, July 30. Final declaration stage 10.00am, Thursday, August 2. Form figures supplied by Weatherbys and are correct up to and including the racing of Monday, July 2. May not include some overseas form.